You know how it works by now. Porsche comes out with an all-new 911. Then they follow up with the Turbo models. Then they cut the roof off the Turbo models. It's predictable, but the cars are amazing, so who cares? I don't, considering that the new 911 Turbo Cabriolet not only looks great, but it also delivers 520 horsepower from its 3.8-liter flat six (duh) engine. If that is somehow not enough for you, you can also opt for the Turbo S Cabriolet, which has an extremely respectable 560 horsepower. The cars do zero to 60 mph in 3.5 and 3.2 seconds, respectively. Standard goodies include all-wheel drive, the fabulously quick PDK transmission, and a top that opens and closes in 13 seconds at speeds of up to about 35 mph. Really, what more could you want? 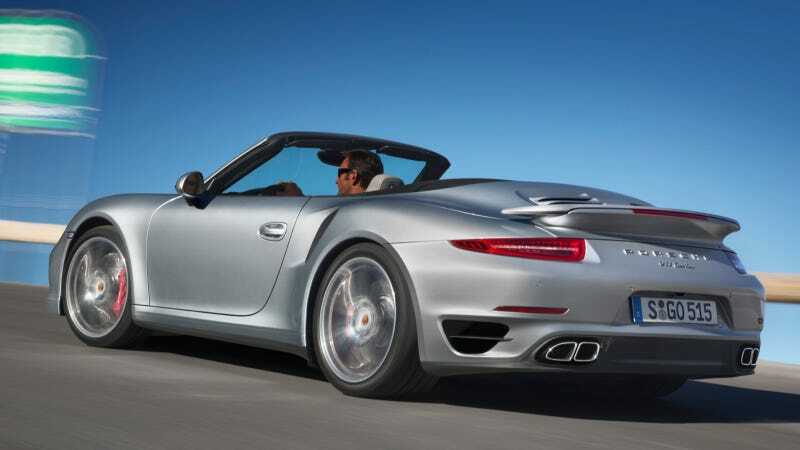 Expect to see the 911 Turbo Cabriolet's debut at the Los Angeles Auto Show in November.